Montrose, produced by Ted Templeman and released in 1973, was Montro's debut album. It featured then little known Sammy Hagar on vocals. While considered a classic by many hard rock fans, tracks from the album have received scant airplay on the radio with "Bad Motor Scooter" being the only possible exception. Without proper support from the record label Montrose eventually went under. But the album has collected quite a following over the years and eventually went platinum. 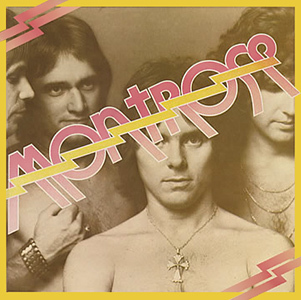 Van Halen had used this album as a blueprint for their own debut and there are some similarities in the sound of the Montrose album to early Van Halen. Ronnie Montrose mainly used a Gibson Les Paul and a Fender Bandmaster and a Big Muff to record the Montrose album. Eddie Van Halen himself considered Ronnie Montrose to be an influence and "Make It Last" was covered by Van Halen in their early club concerts and is available on Van Halen bootlegs, and "Rock Candy" was rehearsed during the sessions for Van Halen's debut album. The album was voted as the 4th best Metal Album of All Time by Kerrang! Magazine in 1989. Iron Maiden has also done a cover from this album. "Space Station #5" has been released as a B-Side from their single "Be Quick or Be Dead" from 1992. Punk band Stiff Little Fingers used the riff from the "Space Station #5" for their single "Suspect Device" in 1978.